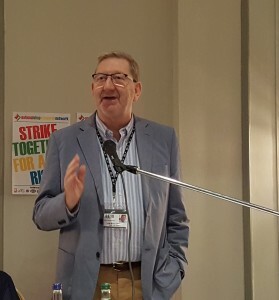 The 2018 National Shop Stewards Network Annual Conference is from 11am-2.30pm this Saturday July 7th in Conway Hall – 25 Red Lion Square, London WC1R 4RL. NSSN Conference meets in the week when the NHS reaches its 70th birthday. Like all other public services, it is under siege from Tory austerity. NHS workers are taking strike action in the North West and are in dispute in Yorkshire. Council workers in East Dunbartonshire in Scotland are taking action and PCS is in the middle of a national strike ballot on pay. There are many other disputes, which are covered every week in this bulletin, from the 2-year long fight by the RMT against Driver Only Operation to strikes by a new generation of workers in McDonalds and TGI Fridays and by mainly migrant workers against outsourcing in the University of London. 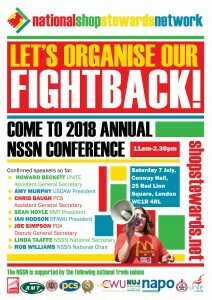 The NSSN Conference is an opportunity to hear, meet and discuss with some of the best fighters in the union movement – from militant leaders and rank and file reps and activists. Come along this Saturday to be part of fightback. The conference will finish in time for people to watch the England vs Sweden World Cup match at 3pm. As a result, we have had to re-jig the agenda. We will be showing the match in the venue. There are also plenty of pubs nearby. Because of the tighter agenda, we encourage attendees to bring a packed lunch. There is also a café that will be open until 2pm. Unite announce strike days on Total’s oil and gas offshore platforms (5 July) – Unite the union has today (5 July) announced a series of strike days on the North Sea oil and gas platforms operated by Total E&P. Following the overwhelming mandate for industrial action, there will be a series of 24 hour and 12 hour stoppages on the three platforms affected (Alwyn, Dunbar and Elgin), all of which will be forced to cease production. There will also be a continuous ban on overtime commencing at 00.01 hours on 23 July. The dispute concerns the company’s wage review and its plans to force workers to increase their offshore working time. A report by Robert Gordon University identified that workers on three-week, equal-time rotas were nearly twice as likely to experience ill health as those on two-on-two-off shifts. The three on/three off rota pattern is now worked by 56 per cent of the workforce offshore, compared with just 17 per cent working the same pattern in 2007. Starting at 06.00 hours on 23 July, 6 August and 20 August.